I went to the board meeting on 11/17/15 to explain my garden management plan. The plan had been agreed to back in February, but there had allegedly been a complaint about it so I thought I’d better explain to the board what the plan was and how I planned to deal with the complaint. I’m not allowed to know who made it so I have to take their word for it that it happened at all. Also I requested a copy of the complaint with the personal information blocked out and I was told I’d get it but I don’t have it yet, so I’m skeptical about whether it exists at all. It seems that one board member is bitter and resentful that I even have a garden at all, she apparently thinks I don’t deserve “special treatment”. It seems likely that no matter how I manage my garden she will be unhappy that it exists. I did not know this until the meeting but apparently gardening permits are no longer issued at the complex. I got mine in January 2005 so unless the board votes otherwise it seems my garden along with several others is “grandfathered in”. To be angry with me over this doesn’t seem like a very fair attitude to me because the only reason I even got the idea to start a garden here was that the association used to advertise in the newsletter to come to the office and get a permit to start a garden. In other words, I was invited. You can’t rely on the word of the management about too many things, they’ve followed through on several of their agreements with me but have blown off several others. Some of this is no doubt because of the large size of the complex but it’s difficult to rely on their word for anything. If you rely on what they say you are likely to get attacked for it later, even you have it in writing. Some of the people who work here are wonderful to deal with and some give you the impression that they’d be happier if you left and never came back. That is why I would not advise anyone to move here – unless you enjoy conflict and stress. Otherwise there are a lot of good things about it. Unit owners are only allowed a short time to speak, there is a timer that goes off when your time is up. People are allowed to make anonymous complaints about you but if you want to defend yourself you have to go on the record which I don’t mind doing but I sure wish the alleged detractors if they exist were man or woman enough to do the same. The PowerPoint presentation I had prepared was far too detailed to deal with in the time allowed so I requested to present it at the Building and Landscape committee meeting on December 9 and that request was granted. In the meantime, I suggested a couple of compromises on the North and West sides of the building to make the garden blend in a little better with the rest of the complex which were accepted for now. With those small adjustments I’m to proceed with my plan until the Dec. 9 meeting. What will happen after that I don’t know. The management has a copy of my plan along with my contact information and has my permission to share that information with anyone who would like to talk to me about the garden. I have strong ideas about how I want to manage the garden but I also have strong ideas about not causing problems for my neighbors. If a compromise can be reached I want to try it and not just give up. Some things ARE negotiable. 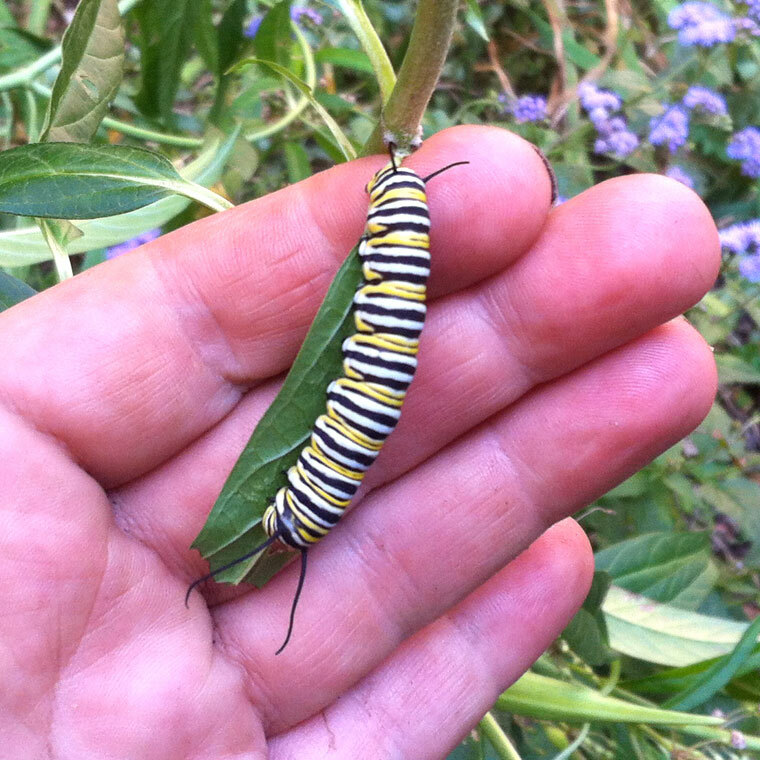 My garden has become habitat to lots of delightful creatures since I started it and is also habitat for at least one endangered species – the Monarch Butterfly. For them, I want to try to keep it going. 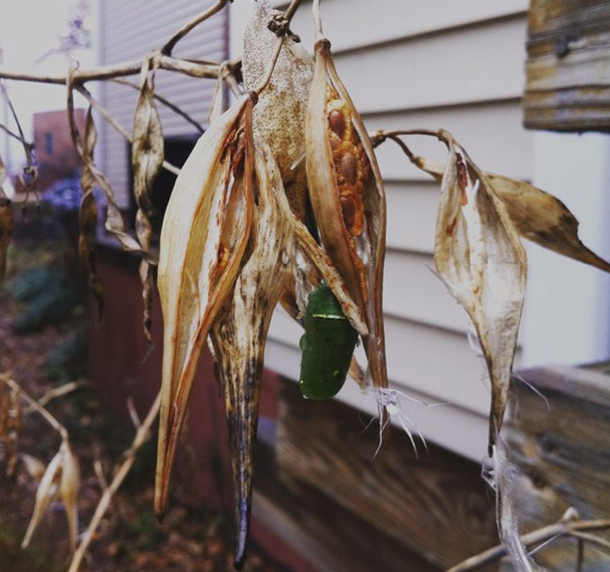 11-27-15 – Monarch butterfly chrysalis on swamp milkweed. On November 19 the leaf blower guys came around again and this time they confirmed with me that I wanted them to skip my garden and I would manage the leaves myself. I confirmed that was the case and sent an email to the condo association and the landscaping company to thank them profusely for their cooperation. On November 23, I applied 20 more bags of mulch to cover the leaves that had fallen since the last mulch application. That was not enough to do the whole job so I did the North and West sides first which are visible from the street. I’ll do the rest at the earliest opportunity – probably today. I also applied some more blood and bone meal fertilizer and the last of my oat seeds which I’m using as a cover crop. November 24 – 20 more bags of mulch completed the job, for now. One of the companies I work for is launching a new product! For any of you who are attending Startup Connection 2015 today, I’ll see you there! Displays That Pay® announced the release of their latest display solutions suite, SHOWCloud™ for Trade Shows at Startup Connection 2015. 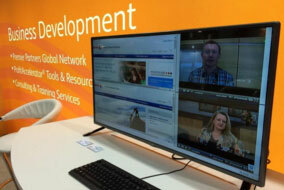 SHOWCloud solutions allow companies to amplify their brand presence with interactive, multi-channel content that is easily displayed on any screen. SHOWCloud transforms flat TV displays into dynamic walls that draw customers to trade show booths, engage them with real-time content and capture leads through mobile tools. The SHOWCloud service provides multiple panels of video, social, web and scanable mobile codes on any display sharing viewable web browser content. Each display provides up to four panels of content that can be dynamically updated on the fly using the SHOWCloud mobile controller on a smartphone, tablet or Internet of Things (IoT) device. To support interaction at events, SHOWCloud for Trade Shows allows companies to display social media feeds like Twitter and Instagram and invite people to interact through hashtags and short URLs. Companies can also display scanable QR codes or use NFC tags at their booth to capture leads or download content. Existing applications from IFTTT services can trigger automated processes to effortlessly transfer a relevant show photo to a display via SHOWCloud’s Dropbox integration. Contact Displays That Pay for SHOWCloud for Trade Show pricing information, which includes dedicated pre-event support and remote support during the event. Displays That Pay transforms flat displays into engaging, interactive marketing walls to capture attention and generate leads. The company’s central product, SHOWCloud, is a cloud-based application supporting brand exposure and sales engagement at major trade shows, events and venues. Learn more at http://www.displaysthatpay.com. Is it possible to have a permaculture garden when you live in a condo complex? I’m fortunate that I’m allowed to garden in the condo community where I live. My garden has been a tremendous source of pleasure and personal fulfillment for the last 11 years. It’s also been a source of occasional frustration. I realize that my gardening style, while common in some circles, is a bit avant-garde for a community where landscapers who don’t use sustainable practices do most of the garden work. Any time people do something different there is an adjustment period and some conflicts. When you garden in a community others’ needs have to be taken into consideration. I’ve found that so far that any challenges that come up can be resolved satisfactorily with open communication and creative compromises. I think all gardens are experimental and frustrating to a degree, in my opinion anyone who sticks with gardening a long time accepts this as part of the deal. My garden is on a really difficult site. When I started the soil was almost pure clay. I have no areas of full sun. I have building shade. I’m surrounded by huge oak trees – they are beautiful and I love them but gardening beneath them is far from easy. Human interference is by far the biggest obstacle to having a good garden at this site. Most people probably would have given up on this project years ago but I’ve gained so much knowledge along the way that I will never regret it. I hope others will benefit from what I’ve learned also by reading about what I’ve done. 2015 has been the most promising season yet, up until what I hope is a minor setback a few days ago. I don’t want it to escalate so I’m going to give a presentation to the board this evening as I understand there are one or more new members. What will the outcome be? Check this space to find out! For this past Father’s Day I made my Dad a blank 6 x 6 journal for a trip we took to Toronto and New York City. Dad wrote notes about our activities in the journal during the trip and we are slowly filling the book in with photos. I’ll be sharing some of my favorite layouts as we go. 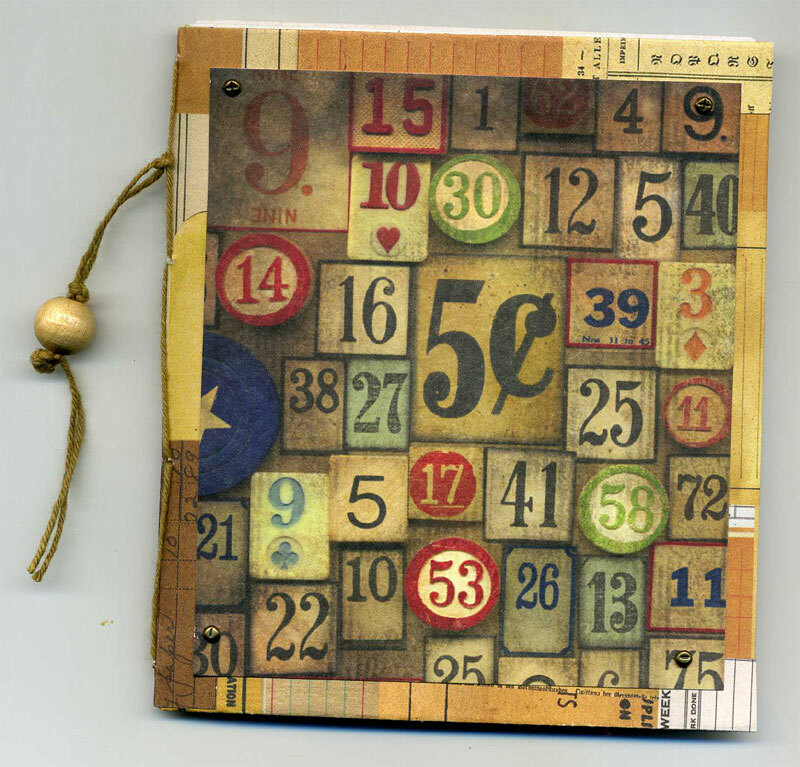 Because the pages are 6 x 6 inches, I’m using a smaller than normal photo format. Using Photoshop, I am making 4 x 6 inch photo montages that I am having printed at a local drug store. 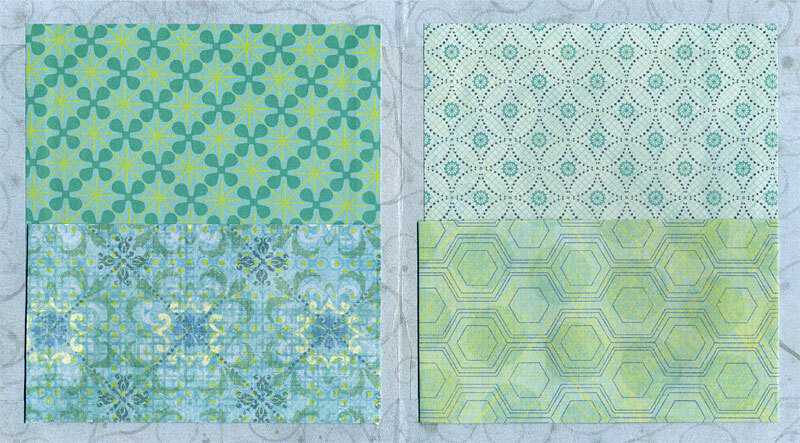 I cut the prints apart and end up with images that are small enough to fit several on a 6 x 6 page. 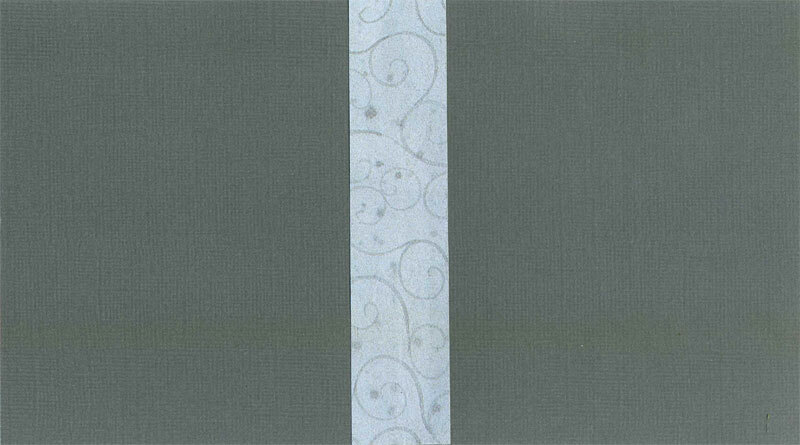 We took a LOT of photos and I’m adding a lot of embellishments, so this book will probably eventually turn into several books. 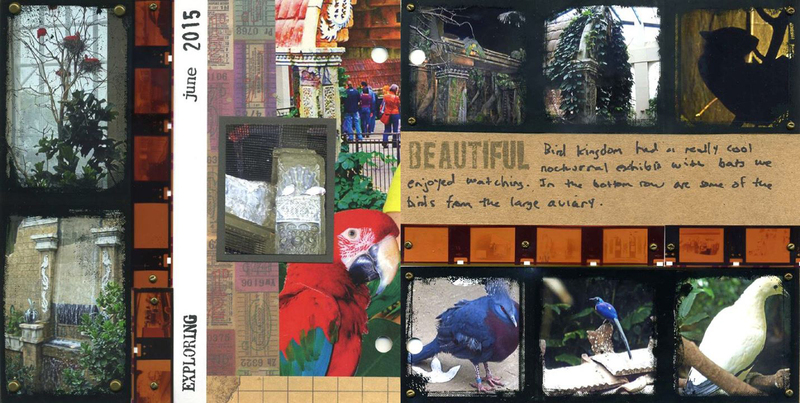 Two-page spread of 6 x 6 scrapbook pages that use discarded photo negatives as a decorative accent. A client of mine threw out a bunch of old photos and negatives, so I saved some of the interesting ones to use in mixed-media artwork. 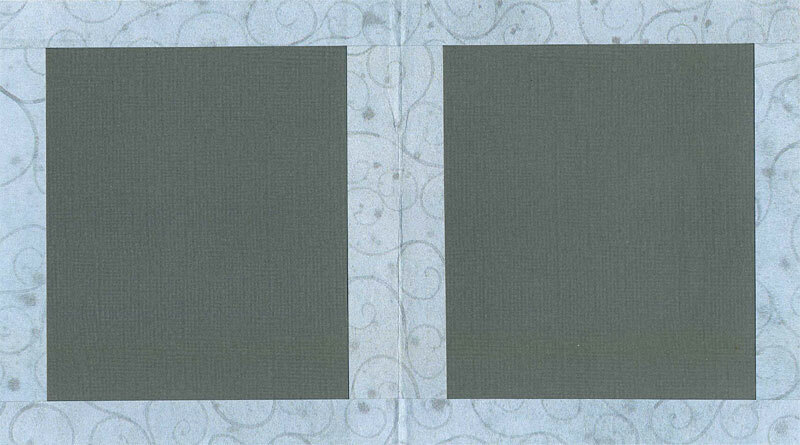 The tiny negatives shown above have nothing to do with the subject matter of these two pages shown here but they are so small you can’t tell and I was intrigued by them as a design element. 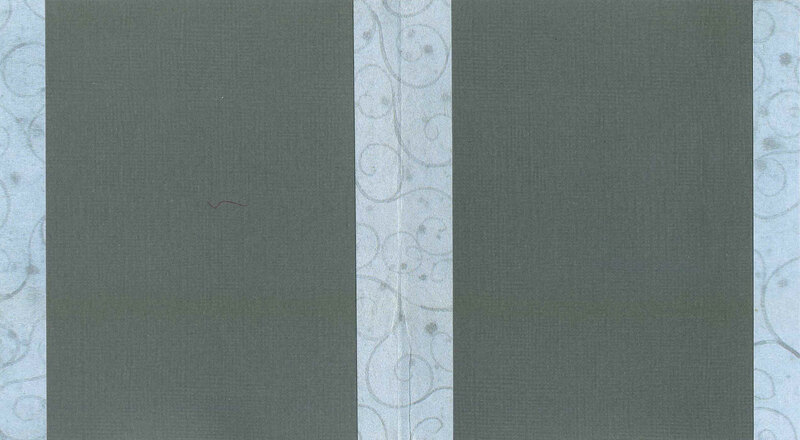 I decided to include some on these pages attached by tiny brads. To unify the look of the pages, I downloaded some free digistamps and altered them into a frame graphic which fit my printed photos. I had the frames printed out on clear transparency film and layered the film over my photos with more of the brads. 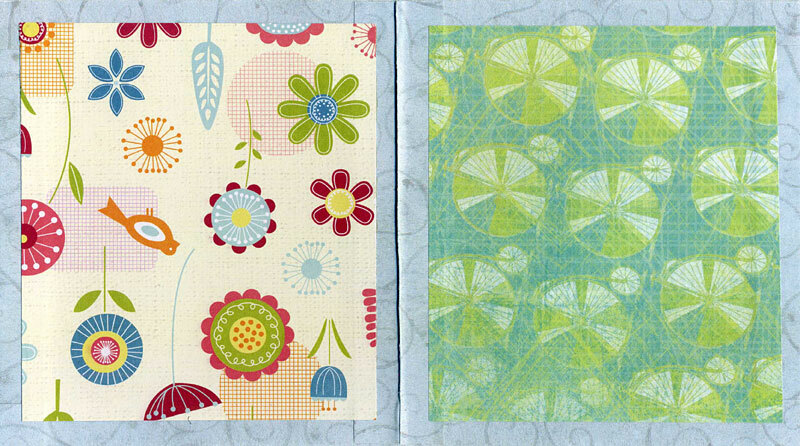 The “Beautiful” stamp and the decorative papers I used are from 7gypsies and the other rubber stamps are from my own Carolyn’s Stamp Store collection. The Interstate 44 / Historic Route 66 corridor southwest of the St. Louis, Missouri metro area is an embarrassment of riches for outdoor enthusiasts. Opportunities for bicycling, hiking, boating, camping, fishing, bird watching and many other outdoor activities are easily available to Route 66 enthusiasts who want to take a healthy break from driving a motorized vehicle. Route 66 State Park is a must-see for the Route 66 fan but there are abundant other interesting choices for outdoor recreation in the area, many with historic connections to Route 66. Route 66 State Park is a great choice for flat walking and biking trails. 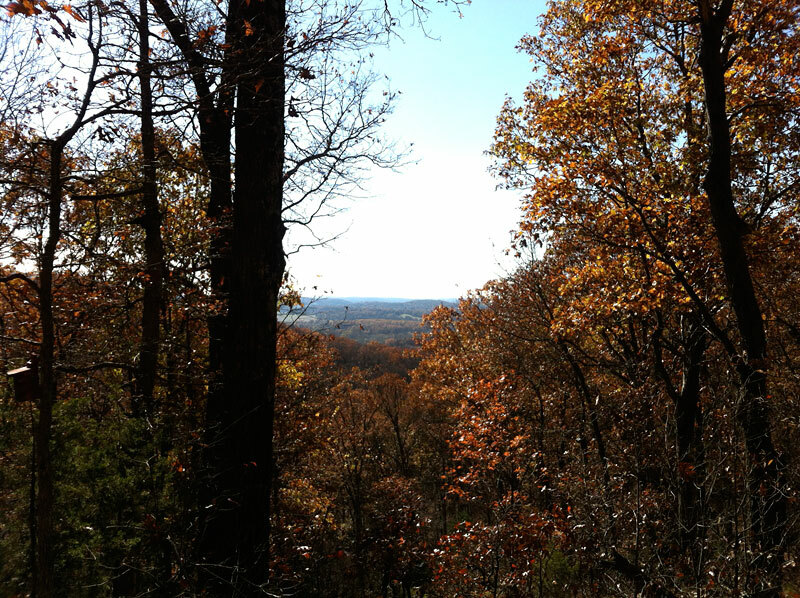 If you’re in the mood for some hills, take a look at West Tyson County Park. You’ll see the entrance to this park on the way to Route 66 State Park if you take the Lewis Road exit (#266) off of Interstate 44. Last weekend I parked at the trailhead for the Flint Quarry Trail loop and started my hike. It was supposed to be about three miles, but there are lots of connector trails to other trails and other parks in the area and I was on another trail for some of the time and ended up hiking just under five miles. All the connectors make this trail kind of confusing, so be sure to have a map with you when you set out. Some of the twists and turns on this trail are extreme which makes it pretty easy to see where you are on the map. Without a map I would have felt apprehensive and it’s possible I would have gotten lost. While the trail is hilly and rocky, the switchbacks are really well done and the climbs tend to be broken up into short segments so I didn’t find it overly strenuous. Besides a map and your normal hiking safety gear, I recommend at least two bottles of water – more if you have room, in case you get off the trail – hiking boots with ankle support and a walking stick to make this hike comfortable and safe. The trails in this area are used by mountain bikers and horseback riders, so be alert and give them room to pass. The main natural attractions on this trail are scenic views from the ridge tops, beautiful forest and intriguing rocky outcrops which were once mined by Native Americans to make stone tools. If you’re into the hobby of letterboxing, there are some man-made attractions here too for you to try to find. I searched for four letterboxes during my hike and actually found one. That’s typical of my usual ratio I must admit! On the restroom / shower building at the trailhead is mounted this commemorative plaque which marks the transfer of ownership of a portion of the park land from the Federal government to St. Louis County. Like many parks in the St. Louis area, West Tyson’s history includes military use in WWII. 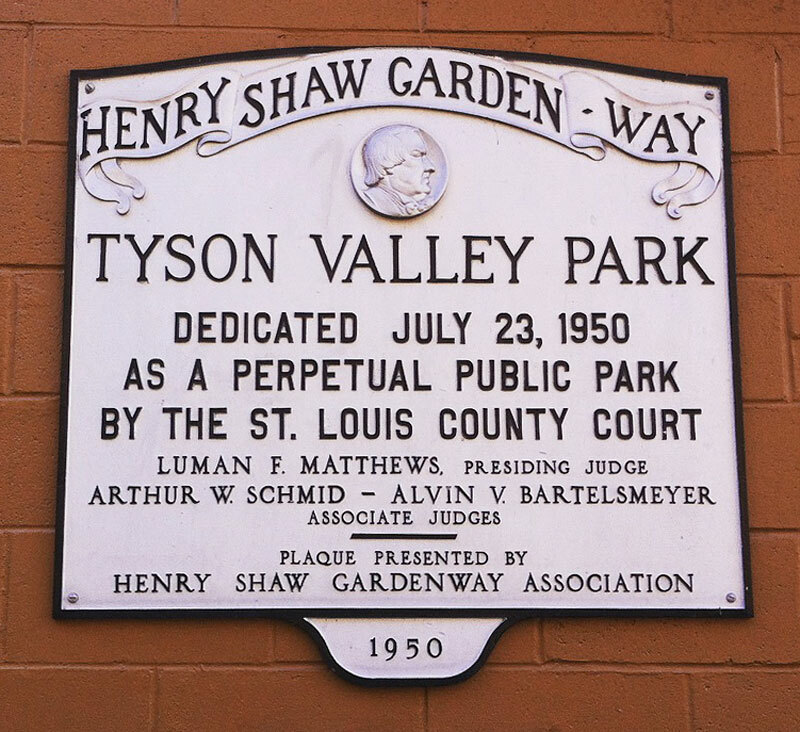 The tract known as Tyson Valley Park was reclaimed by the U.S. Military in 1951 for use in the Korean War effort and repurchased by St. Louis County in 1963. The article “The Tyson Valley Area” by Conor Watkins helps explain who owned what when and is a great overview of the history and recreational opportunities in the area surrounding West Tyson. The Henry Shaw Gardenway has its origin in the founding of the Missouri Botanical Garden Arboretum, popularly known as “Shaw’s Arboretum” as the garden itself is popularly known as “Shaw’s Garden”. In 1923 Missouri Botanical Garden purchased land in Gray Summit, MO to house plants that were in danger from St. Louis city pollution. In 2000, this land was renamed “Shaw Nature Reserve” and is a great place to hike and view nature. In 1935, a portion of Route 66 from the St. Louis city limits to the arboretum in Gray Summit was dedicated as the Henry Shaw Gardenway. The well-known Route 66 landmark Jensen’s Point in Pacific was named after Lars Peter Jensen, president of the Henry Shaw Gardenway Association. It’s difficult to find much more information about the Henry Shaw Gardenway other than it existed and another remnant, a stone bus stop, is now located in the Shaw Nature Reserve. The CCC participated in highway beautification programs throughout the country in the 1930’s and the Henry Shaw Gardenway was one of the roads enhanced by their efforts. Blackburn Park in Pacific is another landmark extant on the Gardenway that I know of. It’s an intriguing part of Route 66 history that I want to know more about. The Henry Shaw Ozark Gardenway was/is a modern-era organization with the mission of preserving the Ozark foothills along Interstate 44 and promoting maintenance and expansion of the Ozark Corridor series of parks. Their web site is not currently functioning and I don’t know if it’s still in existence. 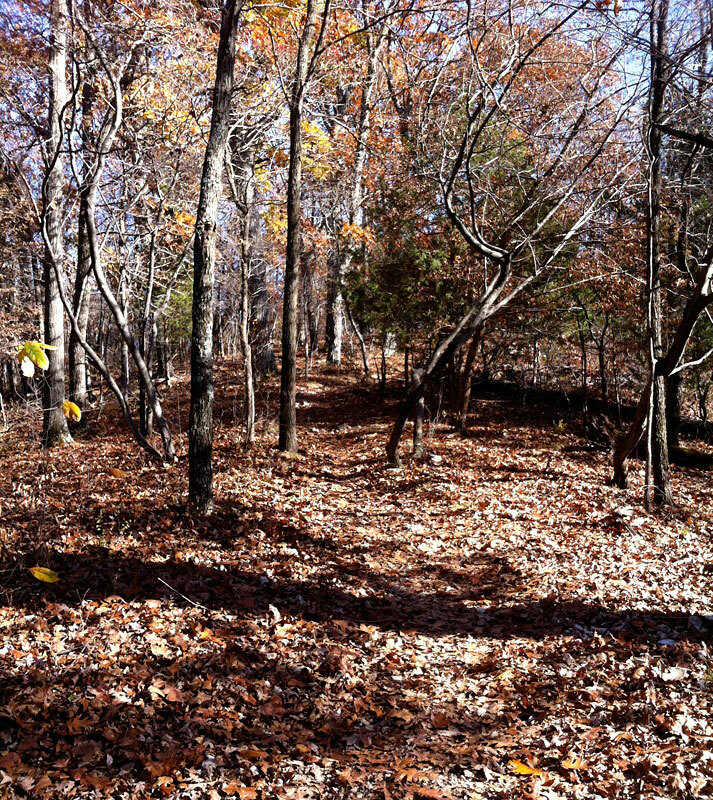 There is a great map of natural resources along the corridor here – Henry Shaw Ozark Corridor. 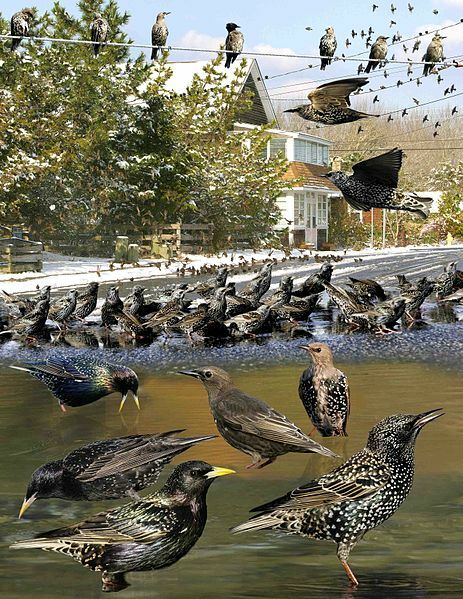 European starlings form large flocks in fall and winter – here are some tips to help keep them from taking over your backyard bird feeders.